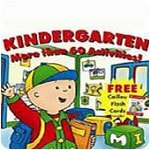 Kids Educational Games - Download and Play 31 Free Kids Educational Games! Educational - Fun learning games for kids from preschool on up! Improve Your Typing Skills With This Fantastic Educational Game! 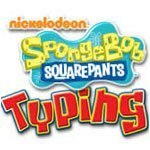 Help SpongeBob Win the Typing Tournament! Explore Four Storybooks to Find the Crystals and Save the Crystal Kingdom! 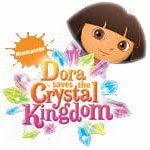 Help Dora Win Lots Of Fun Prizes! 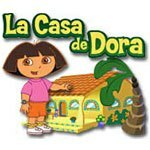 Explore The Fun Inside Dora's Home! 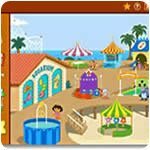 Have Fun at the Carnival with Dora the Explorer in the Educational game Doras Carnival 2: At the Boardwalk! 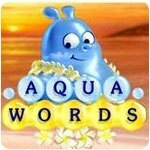 Make words out of fun bubble letters. 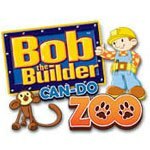 Build Bobland Bay Zoo from the ground up! Save the Carnival and do fun educational activities! Learning counting and spelling is fun when playing with Caillou! Learn shapes, colors and the alphabet in three languages. Help Dora and Swiper save a lost baby fox! 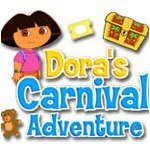 Learn, have fun and win great prizes at Dora's carnival! Get Ready for 2nd Grade with a Worldwide Adventure! Get a headstart on your child's early learning skills! Exciting story & game combined with age 7-9 math! Learn how to play piano with this free portable music app. Stop a madman who's turning people into appliances! A fun and fast-paced game that anyone can pick up and play! Computer games have been extremely popular over the last several decades. People of all ages enjoy playing games on the computer as a form of entertainment. Unsurprisingly, computer games are especially popular among children. Educators have taken advantage of this fact to create computer games specifically designed for children. These video games are often referred to as “educational games” or “edutainment”. They are designed to teach or reinforce concepts and ideas in the context of a computer game. This means that kids can learn while they are having fun. Kids computer games often allow the child to interact with the characters in the game. They can manipulate objects and variables in an effort to solve a goal. Often, they must learn how to solve puzzles, learn facts, or learn new skills before they can advance to the next level of the game. 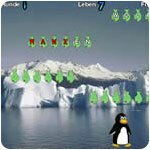 Some computer games force children to plan ahead and can be effective at developing their strategic thinking skills. After working on and improving these skills in the context of a computer game, the skills can often be transferred over and used to solve problems in real life. Computer games used for education are a hot topic among many educators. Computer and video games are often portrayed in the media as mindless entertainment that often does more harm than good. However, there have been emerging studies that actually show the opposite. For this reason, many school systems in the United Stakes and the United Kingdom have begun to include computer games as part of the educational curriculum. One of the first and most widely known computer game for kids was The Oregon Trail. This game was originally developed in 1971 by three student teachers in Minnesota. One of the teachers had the idea to create a video game based on a history class that he was currently teaching. By 1974, the game was accessible by students across Minnesota. The first Apple version was released in 1978, and proved to be extremely popular. Subsequent editions were released in 1980, 1985, 1992, and 1997. As late as 2009, an updated version was released for the iPhone. Many adults today can remember playing The Oregon Trail on Apple computers when they were in school. Another extremely popular educational computer game was Where in the World is Carmen Sandiego? developed by Broderbund Software in 1983. This game was originally designed as an effort to get children interested in geography facts. In this game, the player acts as a detective and tries to hunt down Carmen Sandiego as she travels around the world committing crimes. Players would have to know geographical facts in order to follow the right clue leading to the capture of a criminal. This game, originally on the Apple II computer system, also spawned a wide variety of spinoffs, including Where in the USA is Carmen Sandiego?, Where in Europe is Carmen Sandiego?, and Where in Time is Carmen Sandiego? 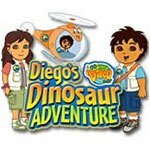 It also spun off several television game shows for children on the PBS network. Another classic kids computer game was Math Blaster. Math Blaster was first released in 1987. This game made math fun for kids by forcing them to quickly solve math problems as an integral part of the game’s fast paced shooter gameplay. Based on the popularity of Math Blaster, a sequel was produced in 1989, and soon an entire suite of games we produced under the Blaster Learning System brand. These included Reading Blaster and Science Blaster. Who Might Like These Types of Games? These games can be great for teachers and parents. Many parents are reluctant to let their children play video games when they would rather have them reading or playing outside. When children ask for video games to play, these can be great. Parents can be sure that their children are getting a learning benefit from them as well as having fun. Teachers also are constantly looking for ways to educate their students in a fun way. These games can be a way to accomplish that; engaging the mind, teaching skills, and solidifying the concepts using interaction, audio, video and entertainment all at the same time.